In the early schematic design of composite steel structures, structural engineers can run dozens of different typical bays to determine the expected depths of members and average weight per unit of area for the building. The process involves either developing a 3D analysis model and applying a uniform loading to the bay and then running a vibration analysis on the bay to assess any changes in sizes. This is repeated for each bay, and for each variation that comes up during the early design process. However, this process has a lot of prerequisites, not least of which is access to a computer with analysis software installed and licensed. Developing an analysis model in a conventional analysis software usually requires a significant time investment. The results of the analysis also need to be converted to a different medium be reported to a client, sometimes in the form of a basis of design report. Skipper’s aim is to streamline this process. With some basic geometry inputs, a deck definition and concrete definition, Skipper will design the bay in a matter of seconds. Since it is a web application, inputs can be saved directly to online databases for easy retrieval from any device. To do this, Skipper uses the American Institute of Steel Construction strength and vibration design guidelines. 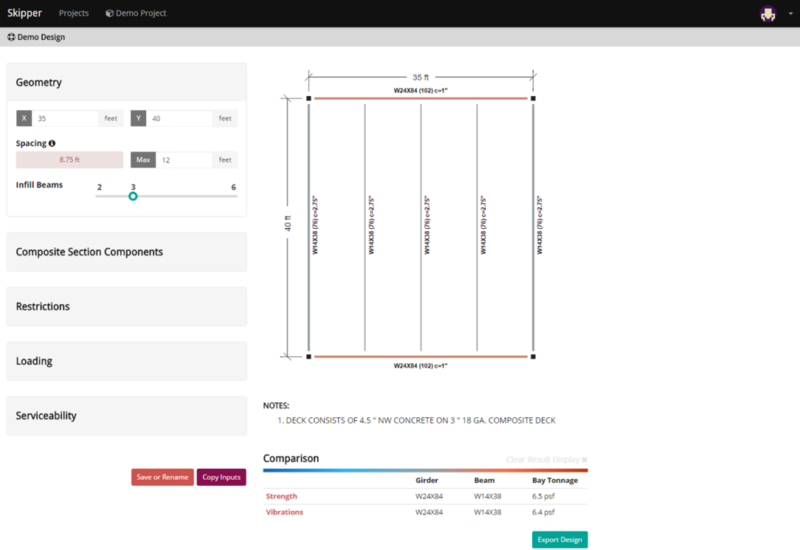 Thornton Tomasetti also develops its own composite steel beam design guidelines, which have informed the back-end library that runs Skipper, CORE.Structure.